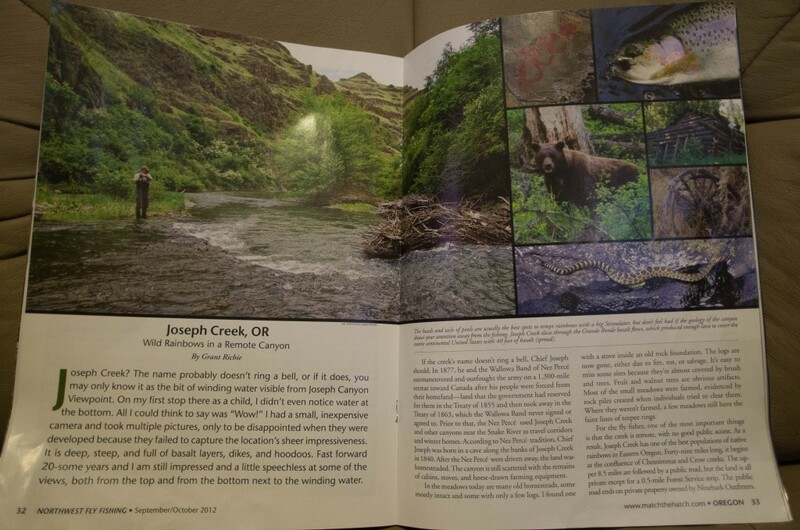 Hot off the Press: Joseph Creek is featured in the September/October 2012 issue of Northwest Fly Fishing. The article is by fishingandhiking.com’s very own resident fishing “expert” Grant Richie. The feature article is a very nice 8 pages long with great photos showing not only bears, rattlesnakes, and mountain goats but also showcasing the debut of several fly fishing models including long time friend of the blog and first time fly fishing model, Jeff Northam; wife of resident fishing expert and co-owner and operator of Minam Raft Rentals, Lottie Richie; and for the first time seen in print, The Boys (Kolby, Mason, & Brenden) shooting their sling shots on a hike into Joseph Canyon. OK, I am the only one here and it is me writing about me but it is a good article. Of course I am biased since I wrote it so you had better pick up a copy to judge for yourself at your local fly shop or order one online at www.matchthehatch.com The centerfold teaser is below. Feel free to send emails to Northwest Fly Fishing extolling its qualities and encouraging them to triple any fees paid to the author in the future. Go to www.matchthehatch.com to order your issue. This entry was posted in Joseph Creek. Bookmark the permalink. Way to go Grant!!! I’ll be picking up a copy as soon as I can! You didn’t tell them how to get there did you? Getting there isn’t the hard part. Getting out is and that will keep traffic in Joseph Creek low. Well there are the abundant bears, rattlers, and ticks that also tend to deter people. Oh and the heat. Oh and . . . I subscribe to Northwest Fly fishing and my buddy and I are wanting to attempt a float. We have floated the Wennaha down to Troy some years ago using inflatable kayaks as the one pictured in your article. We can’t get away until July. Can we float from Chico down to Rogersburg? Have you tried it? I have floated Joseph Creek 3 times. First time I hiked in the Tamarack creek trail and floated out to Heller Bar. Second time I hiked in the warm springs trail and floated out. Third time I hiked in on the BLM ground just below the forest service ground and floated out. It is a much harder float than the Wenaha. Joseph Creek is really rocking in the bottom half and there are lots of strainers and sweepers. Although the water is primarily class III, I personally think only class IV boaters should try this float due to its remoteness. I would hate to see someone get hurt down there. I just realized you said July. Joseph Creek will be too low to float in July. It has a very small window from sometime in late February to sometime in May depending on snowmelt and rain.